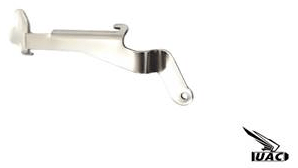 UAC new product – Match grade stainless steel trigger lever for TM G17 is now available. UAC Match Grade Stainless Steel Trigger Lever was specially designed for heavy use and capable for high tense competition needs. By the use of stainless steel and enhanced strengthen design ensure the lever was in perfect shape and transfer the force directly to the sear, gives you a solid and smooth trigger pull. Modified disconnector structure prevent jamming and abrasion to the BBU. Also, it is high polished and minimize the friction to every contact point, keep it run smoothly and keep every parts in the gun have a minimal abrasion.